Another new challenge for me. I'm still making adjustments to my arting time. 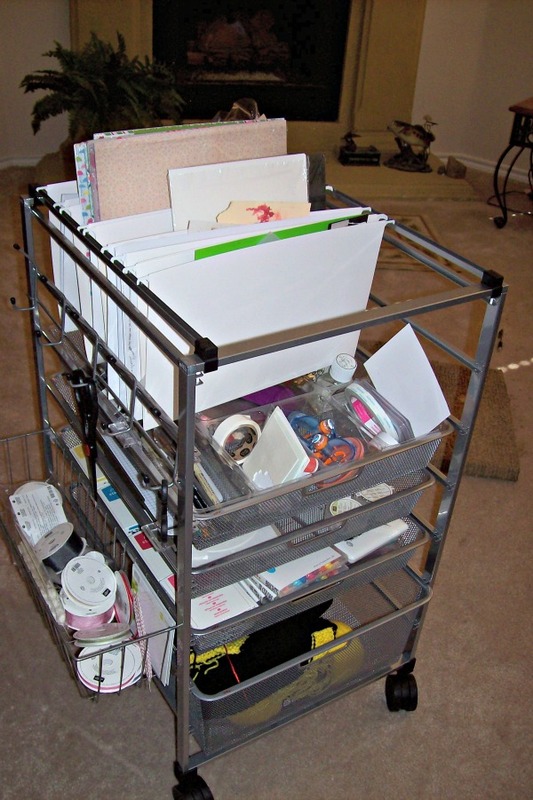 With the help of Elfa I put together this rolling cart with the supplies I use the most and this mini table I got a few years ago at Big Lots to have by my chair in the den beside my Mom. While she's watching TV I can be on my lap top and do some projects and still be available to help her when she has to get up for various breaks and 4 short walks a day around the house. Still have to make forays into my studio, but that's good exercise for me + Mom's 4 . One of my friends told me the other day that you need to get in around 10,000 and something steps a day, I know I'm no where near that, but some is better than none. In my last post I said I got interested in Zentangle last year, but actually it was 2009. I looked back in my zentangle journal which I did start in Jan.. 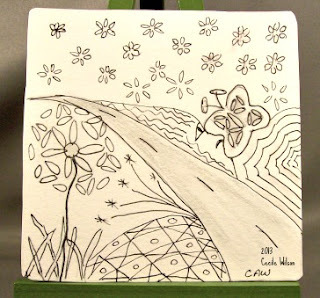 I gathered all my zentangles together and started the journal so that they would not be scattered . We for sure want to give a shout of sympathy to Laura on the death of her Grandmother, but she said she got to sit with her before she passed and that will bring some comfort and good memories. I've got my friend Cecile's Zentangle here also. Until she gets hooked up with a newer computer and gets her own blog going I'll be adding her tangles to the challenges from here. Laura's challenge was to use the Quandry tangle in some way. Cecile and I read quite a few people's blogs and a few of them said they had a little trouble getting the hang of this one. We both practiced, but we both had a little trouble getting the hang of this one also. 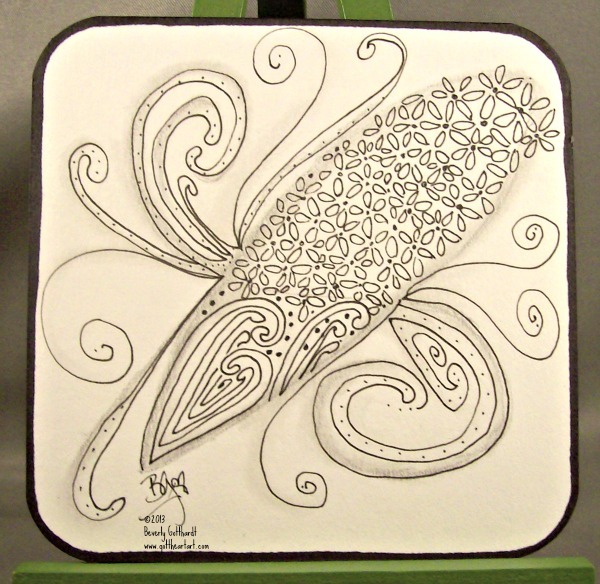 My piece came out looking more like a squid or some such of a thing, but that's the beauty of Zentangle it doesn't have to be anything, and Cecile came up with a scene. She's still getting the hang of letting go and just creating without it being something. 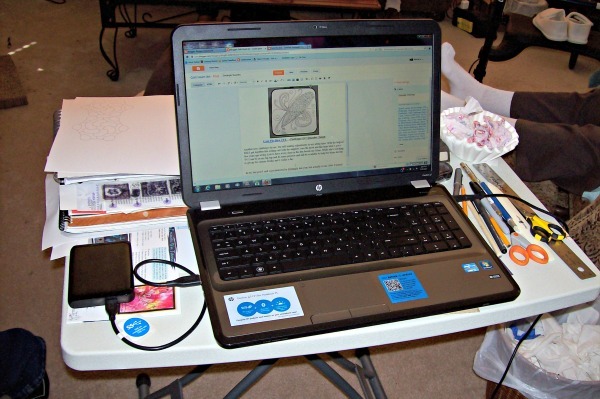 If you don't have but a few minutes to create something, but still like to enter challenges check out the previous post and check out Laura's site where you can enter your little creations and get to see some other artists who can really Zentangle. Great that Cecile and you are here again. And, shall we say that there are no 'better'tanglers, but just 'different'?